On one of my precious Sunday, I was down at Loreal filming Maybelline x Michelle Chong (aka Golden Tan) online viral video. Larry Yeo, a celebrity makeup artist appeared as the guru makeup artist. It was a pretty good experience as I get to see Michelle Chong act out a new role IRL which do not deviate too far from her "pan-asian" roots haha. It was really funny seeing her act. The Maybelline peeps found it so hard to contain their laughter, much less me, when we did not even have any rehearsal prior to filming. Here are some of the behind-the-scene shots which Michelle Chong's assistant captured using my camera haha. This photo below was taken after I had the BB stick applied on my face. It has extreme whitening effect, at least on me haha. I am currently using the BB stick (01 fresh) on casual days and I find it pretty good as my face do not get as oily as it would 3-4 hours into the day. 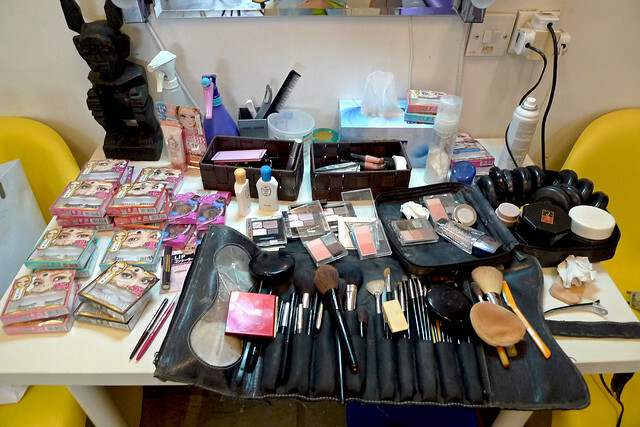 I turned up for Heroine Make makeup shoot for Cleo magazine Sept/Oct issue on one of the weekdays. Call time was 8am in the morning and I struggled so hard to wake up. Poor John had to drop me at the studio instead haha. So I was scheduled to do this shoot with Peiling, one of the girls whom I met way back in 2008-2009 while filming Hey Gorgeous! Grabbed this photo off her blog here. Peiling whom has always been mistaken as an ice queen is actually really hilarious once you know her well. And I am really the no-image woman once I warm up to you and start playing around. We even had an idea to do a video series together where she will be starring as a Thai girl, Swee Mak Mak Tuk Tuk whatever, and I will be a Japanese idol, Blahyumi. We will show the world the other side of us haha! But I still look like death. How do people wake up so early and look good!? The makeup artist is pretty good with base makeup and hairstyling! Impressive I would say! He is using my favourite eyeliner from Heroine Make if you can see from the photos! Their lashes are pretty awesome. They are superbly feathery and lightweight. I especially love the natural looking ones on Peiling! My tip to stretch your dollar for the money spent on your eyelashes. Buy a good water based makeup remover like Biore Hydra Clear (I have personally been using this forever and I swear by it!). Place the eyelashes on your palm and pour 2-3 drops of the makeup remover onto the eyelashes. Then gently rub it until the glue and mascara dissolve. 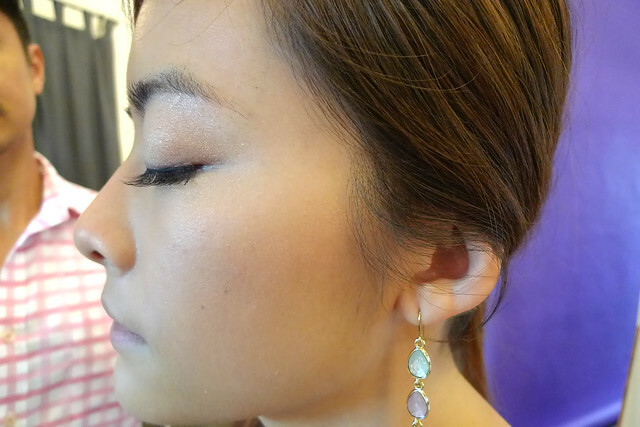 Usually in the process of pulling the falsies out from your eyelids, you will tend to spoil the bone of the eyelashes. To maintain the U-shape bone supporting the eyelashes, soak your clean falsies into a bowl of warm water (not too hot please). The heat from the water should be able to loosen the bone slightly. Dry the lashes and place it on a flat surface. Make sure you adjust the bone so the lashes lie down looking as good as new with a beautiful U-shape bone. When it dries, the "new" U-shape will stay and facilitate easier application.